Shoot us an email anytime, we'll get back to you as soon as we can. Welcome to the Last Ditch Racing website! I first got involved in rallying after seeing the SCCA Maine Forest Rally, ProRally on ESPN2 and then the WRC coverage on Speedvision. I knew I had to race, and soon found that the most popular event in the championship was in my back yard- The Maine Forest Rally! In 1999, I sourced a Honda CRX and started building a rally car. Not knowing what or how to do it, I turned to the internet and found some great websites and helpful rallyists to help answer my questions. The car served us well and we followed by a switch to the Subaru Impreza. Our first Impreza was a 1994 with a 110bhp 1.8L motor and AWD. The car then got a 2.5L Impreza RS engine with a Link ECU. Then, we moved into a similar GC8 chassis, but with a JDM V2 WRX turbo drivetrain, also with the Link ECU. Our current car is a 2003 USDM WRX with a V7 STi drivetrain and Hydra EMS engine management. I am now in my EARLY 40's, a native of Bangor, Maine and currently work as a Physician Assistant at Penobscot Community Health Center. I enjoy my family, chocolate lab, music as well as motorcycles, Land Rovers and my Unimog. A word of thanks to my loving wife, Sharon and my two sons, John and Cullen. A big thank-you to my good friend Pete Matthewson, who also built a CRX rally car(see pictures on our site) and helped to inspire me in the sport early on. We only met after more than a year of correspondence on the 'net(Pete being from Colorado). Dave's involvement in rally racing is mostly John Cassidy's fault. Actually, Dave's car story starts in 1963, when his uncle gave the little 9-year-old a memorable ride in a fuelie Corvette. Dave eventually grew up into a car nut of the highest order. He's campaigned classic VWs, Saabs, Mercedes and Porsches at club events, concours and road rallies since the mid-1970s. Dave began rallying more seriously a couple of years ago, competing in Porsche Club TSD rallies, the Subaru Ontario Winter Rally Series, SCCA road and performance rallies, as well as Canadian Association of Rally Sport (CARS) national events. He's completed training courses in winter driving and advanced co-driving at the Team O'Neil Rally School. Dave's job as co-driver for Last Ditch Racing is to keep driver John Cassidy on course and on time...and most crucially, to know what's on the other side of that next blind crest! Of course, there might be some additional duties out on the stages: changing shredded tires, shoveling snow after off-road excursions, or improvising repairs to coax a banged-up car back to service. In his more normal life, "Getch" is a writer, TV producer, and magazine editor. He's worked for magazines like Canoe, Backpacker, Climbing, and AMC Outdoors. His film career includes producing nearly 100 episodes of the PBS-TV outdoor adventure series Trailside and Anyplace Wild. He's currently Associate Publisher of Maine Boats, Harbors and Homes magazine. He lives on a river in midcoast Maine with a Springer spaniel pup and a motley collection of vehicles--a Subaru WRX wagon(LDR's recce car), a beat-up Ford truck (LDR parts runner), and various ancient Volvos (one of which someday may become a Historic Class rally racer). Duncan has been with us nearly from the start. He arrived on the scene via Dave Getchell, living just down the street from him in Camden. Duncan was amazed that we were going to a race with a car that didn't run as it was loaded on the trailer, but he was nonetheless smitten. Maine Forest Winter Club Rally was his first event and he's rarely missed an event since. Duncan is active at home with his children and enjoys his work as a Ski Patrol member/EMT at the Camden Snowbowl ski area. Bronson has the biggest noggin of anyone on the team-at least there's more in his than the rest of ours! A past life of welding at Bath Ironworks on battle ships during college sees him recapturing a bit of that fabricating zen in the shop. He is constantly being asked to cobble, fab, engineer some piece or sub-compenent of the rocket ship we affectionately call Steel Tulip 4. His day job is working on revolutionizing the world of mass spectrometry through his engineering work at Stillwater Scientific in Orono, Maine. Time of Flight has a different meaning in his office than it does in Dave and John's rally office! Drew joined LDR in 2008 and is already making an impression. A service writer for Darling's Honda/Volvo in Bangor, he was introduced to rallying via his mother-in-law, who works with John Cassidy. A car fanatic, and organizational freak, he is attempting to streamline team operations as well as relieve John and Dave of extraneous tasks so that they can focus on developing their skills in the car. Rob joined LDR in the summer of 2006. He has raced in the SCCA Rallycross series for the past 4 years and has aspirations of owning his own rally car someday. Rob was introduced to LDR through Mike Rademacher with whom he Rallycrosses. He came onboard working service for Dave Getchell and Steve Mckelvie at Maine Forest Rally and Team O'Neil's Rally that year and has continued to work with the team since. Rob received his Associates Degree in Automotive Technologies from Eastern Maine Community College in the spring of 2007. Most days, you can find him sitting in his truck, somewhere downtown Bar Harbor delivering frosty malted beverages to thirsty tourists. Having been raised in the back woods of many a small town across Maine, Rob learned to drive at an early age, "I got my drivers permit when I was 17 and that was the first time I had driven on pavement." Since then he has always been a "car guy" and loves to drive them hard and fix them often. For the past 11 years he has been married to his loving and VERY tolerant wife Peggysue and they have been blessed by their two children Gregory and Raven Rose. He and his two children are members of the Penobscot Indian Nation in Old Town, Maine, where they currently reside. Rob is active in his culture and with his younger brother Nate and his older brother Chris, together they sing traditional and contemporary Native American song with the rest of their drum group RezDogs. Nate has been in love with Rally for almost 20 years. He used to wait for the day that he would see a rally race show on a sports channel, just to see more. It wasn't until later in his life were he realized that this sport was closer to home then he expected. Having been bitten by the rally bug almost 5 years, he has done everything in his power to do what ever he can at the race. In real life, Nate is a Full-Time student in Fire Science Technology. A volunteer Firefighter for Penobscot Nation Fire Department, and a Callman/EMT for Orono Fire. He has a Wife Samantha, and a Son, Byron 4. 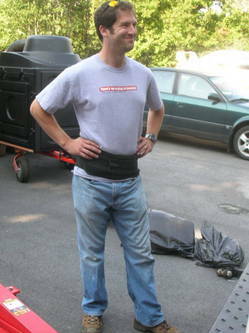 Team Manager/Equipe De Service, on sabbatical, aka "E"
Eric Wages was a late bloomer in the car-fanatic category. After spending three years overseas and watching UK and WRC rally on Channel 4, an almost primal instinct was developed for all surfaces gravel, tarmac, and snow. When it came time to buy his first car out of college, the then-newly introduced 2002 Subaru WRX was the obvious choice for this longtime rally fanatic. After buying the WRX, Eric was looking for fellow rally enthusiasts, and happened upon John Cassidy's Last Ditch Racing site. Since he and his long-time girlfriend Margaret were moving to Bangor, Maine, he asked John if he needed a spare hand or two doing some simple mechanic work on the car. John graciously agreed, and the rest is history. Eric has played a pivotal role in the history of the team, performing many electrical development duties, including ECU tuning. He's also worked in the role of team manager, mechanic and general jefe. Adapt at all roles, his absence from the team over the past few years has been deeply felt. When not rallying, Eric works for Google and is currently a flatlander down South. 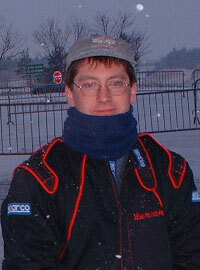 Past Co-Driver, aka "Mr. Lee"
Erik started his rally career co-driving primarily for Dave Getchell. Prior to rally he was involved with Japanese superbikes, aggressive inline skating, and snowboard freestyle. With career experience ranging from an Army Mountain Warfare Specialist to Team Oneil Part-time driving instructor as well as a technical desk jockey Erik is truly well rounded for his years. 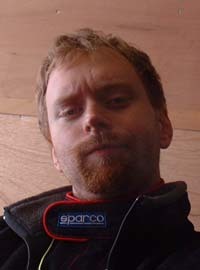 Erik joined John as co-driver in 2006, attending the Corona Rally Mexico. 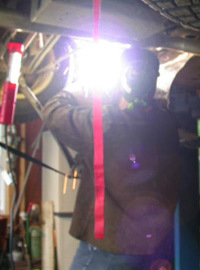 He co-drove John to a 10th overall finish at their home event, The Maine Forest Rally, the team's best overall finish in a US National event to date. He is currently on sabbatical from co-driving, and is enjoying his newfound hobby-skydiving. She then participated in all subsequent Maine Forest events, along with her parents Mike and Sheila, helping with timing, scoring and medical. 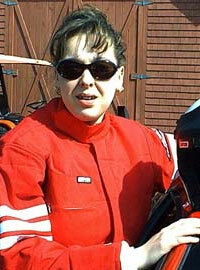 Wanting to get inside a rally car, she contacted John Cassidy in the winter of 2001. Full of enthusiasm, and finding the co-driver position vacant for 2001, she got the ride! She is currently living a, "normal," life without rally and seems quite content. She does make it to local events, when possible.